ZoomIt is a screen zoom and annotation tool for technical presentations that include application demonstrations. 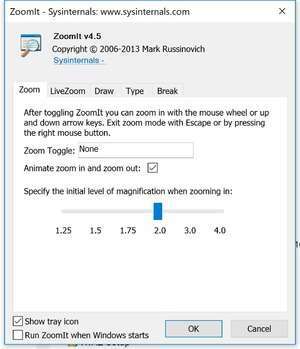 ZoomIt runs unobtrusively in the tray and activates with customizable hotkeys to zoom in on an area of the screen, move around while zoomed, and draw on the zoomed image. I wrote ZoomIt to fit my specific needs and use it in all my presentations. ZoomIt works on all versions of Windows and you can use pen input for ZoomIt drawing on tablet PCs. Version 4.5 is a freeware program which does not have restrictions and it's free so it doesn't cost anything. For security reasons, you should also check out the ZoomIt download at LO4D.com which includes virus and malware tests. Additional screenshots of this application download may be available, too. Featuring the very best in free desktop enhancement utility downloads. Editing staff adds reviews and free download links and constantly updates software. Check out some of the freeware downloads available in the desktop enhancement utility category. They contain no strings and are available at zero cost. 4.5 out of 5 based on 20 ratings. ZoomIt download been highly rated by our users.